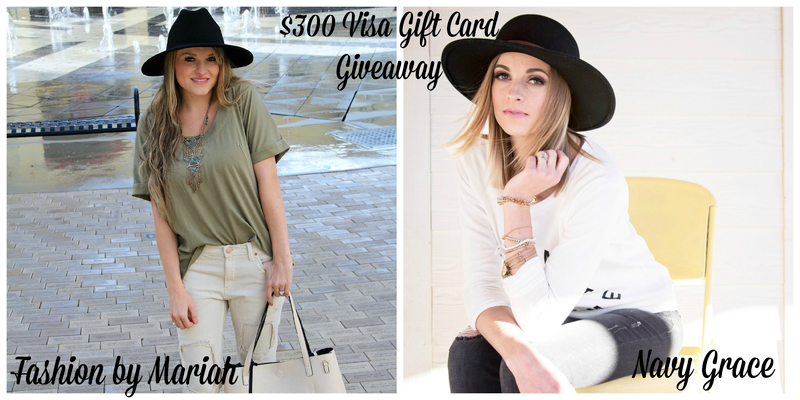 Janelle In Real Life: $300 Visa Giftcard GIVEAWAY! So I know that this is my second giveaway post in a row... sorry for the repetition! I just love you guys so much I want you to win all the things. I have a regular fashion post or two scheduled for next week as well as some baby updates & hopefully a birth story! Stay tuned for those. The reason I like doing these giveaways now and again is because I want to say thank you to you guys, who take the time to read my blog! It means so much. I also like partnering with some of the bloggers that I love so you all can find some more fashion inspiration and great blog reading material. I hope you enter and win some cash for yourself! The link for Navy Grace Blog on liketoknow it is not working. I am registered on liketoknow it so do I just like one of her post to be following her? Also I have the settings in send me an email ASAP on liketoknowit but I do not get an email but maybe once a week. And I can't search on that site to find s blog. It's probably something I'm not doing right. Wow, prize Visa gc is fab. & splendid. 2 fingers snap. It is tight, fly & off the chain. Thank you for the awesomeness, the contest, and generosity. Pick me, pick me! Dear Santa: I’ve been nice. My X-Mas wish this year is to win this contest. Starving artist here desperately needs the $300 gc to shop and eat again. This giveaway looks soooo good!